In 1992, Wayne Huizenga obtained a new NHL franchise that would eventually become the Florida Panthers. Until the team had an arena of their own, they initially played at the now demolished Miami Arena, sharing the venue with the NBA’s Miami Heat. Sunrise City Manager Pat Salerno made public a $167-million financing and construction plan for a civic center near the Sawgrass Expressway in December 1995, and Broward County approved construction in February 1996. In June 1996, the site was chosen by the Panthers, and in July, Alex Muxo gathered more than a dozen architects, engineers and contractors for the first major design brainstorming session. Architects Ellerbe Becket were given 26 months to build the arena, which had to be ready by August 30, 1998, to accommodate the 1998 – 1999 NHL season. Despite never having designed a facility that had taken less than 31 months from start to finish, they accepted the job. 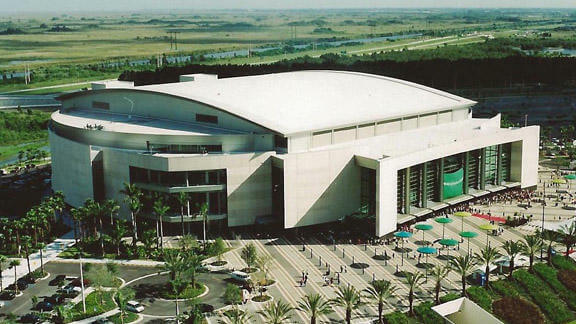 The Panthers moved into the brand new National Car Rental Center, later Office Depot and BankAtlantic Center, now known as BB&T Center in 1998. The BB&T Center (previously known as Broward County Civic Arena, National Car Rental Center, Office Depot Center, and BankAtlantic Center) is an indoor arena located in Sunrise, Florida. It is home to the Florida Panthers of the National Hockey League. It was completed in 1998, at a cost of $185 million, almost entirely publicly financed, and features 70 suites and 2,623 club seats.